I suppose it's located in Havana, but cannot find where exactly (address or GPS location). The most significant feature is the ants in his facade. Does anybody know where it is? Google reverse image search locates the original of this picture. 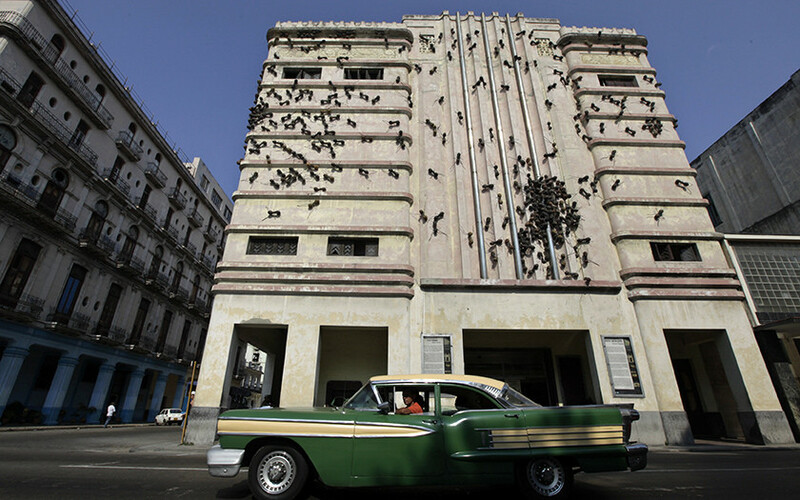 It is the Fausto Theatre in Havana. The ants were a temporary exhibit. That is the Teatro Fausto, on the corner of Prado and Colon, in Havana Cuba. The "ants" you see in the photo were an artist's exhibit in 2012 for the Havana Biennial. They are no longer on the building. It's the Fausto Theater, as identified on this photo blog. More information on the history of the theatre found on cinematreasures.org. Located in the Habana Vieja (old town) district of Havana, on the Prado at the corner of Esquina Colon in the Jaruco neighborhood. The Cine-Teatro Fausto was built in 1938 and designed in an Art Deco style, by architect Saturino Parajon. It has a simple Art deco facade, with vertical patterns above the entrance, flanked by horizontal delineations and has curved corners. Decorative botanical friezes and reliefs suggesting castlations on top. And a Google maps link for the location. Not the answer you're looking for? Browse other questions tagged where-on-earth cuba architecture locate-this or ask your own question. What's the address of this guesthouse in Bulgaria?